For much of the last year, the Democratic Institutions Minister has been positively chipper crisscrossing the country and chatting up Canadians about fixing Canada’s broken electoral system. But now that Monsef’s electoral reform town halls are a wrap, there’s been a slight change of tone. At another point, Minister Monsef expressed concern that the homeless might not participate in a referendum because they may not know what a “referendum” is. 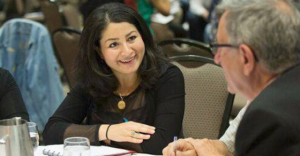 And despite wide support for dropping the status quo in favour of proportional representation at most electoral reform town halls – including town halls hosted by Conservative MPs as well as a town hall in Papineau hosted by Prime Minister Justin Trudeau – Monsef adds that she has “not yet” felt that support.